Residencies, special projects and publications. I had a productive month while at the Brush Creek Foundation for the Arts residency in Saratoga, Wyoming. For the month of April, 2016, I concentrated on painting with color and using the natural wildlife of the Wyoming surroundings as my subject matter. 2011 at the JB Blunk Residency in Inverness, CA. This residency was two months of bliss! 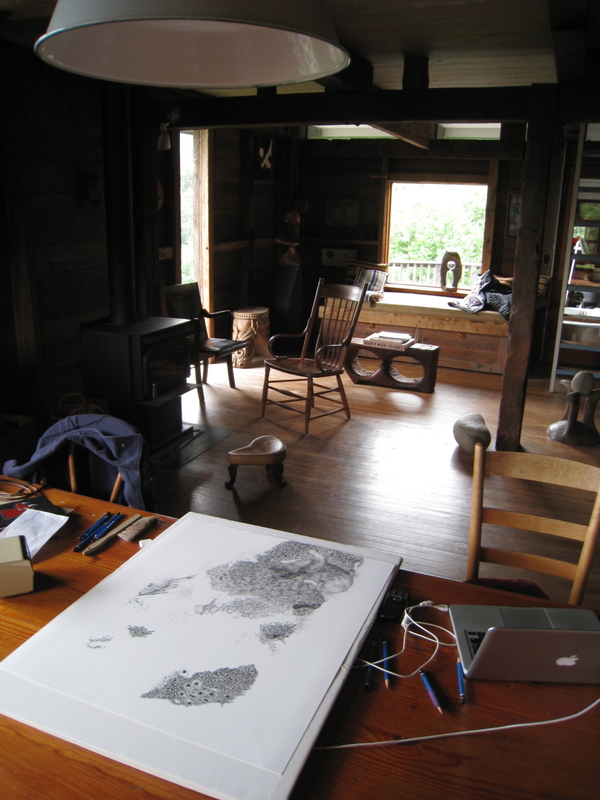 I made many drawings and paintings during my time in this hand crafted California Artist's house. The Inverness and Point Reyes Station communities embraced me as their own and made the residency a home. At the begining of 2016, I created a large painted canvas backdrop for Mr. Paul Gripp, as part of his exhibit of historical travels through the Himalayas. Paul is aslo my Step-father, the past owner of the Santa Barbara Orchid Estate and a great story teller. I was proud to be a part of his educational exhibit about regional orchids of India. Paul's work as a guide and his many years of travel, collecting and discovering were honored at the Santa Barbara Orchid Fair. He of course, won best Educational Exhibit at the fair. Modern Appealing Clothing, a magical clothing store in San Francisco, asked me to design a canvas tote bag for them. The design is a Javalina yawning with two owls on it's back. There are also chef's aprons available. Hudson Vinyards in Napa, California commisioned me to create an illustration for their annual poster that lists their available grapes. The Juxtapoz WILD book. At the end of 2015, several of my drawing were included in the Juxtapoz hard cover book: Wild. In 2011, Juxtapoz Magazine ran a feature article on my artwork. Author: Hanna Stoffer. I am the department head of rugmaking at The Creative Growth Art Center in Oakland, CA. and this will be the first time I have offered to teach rug making outside of the center.